All at Hawaiian South Shore’s Makai Parking lot. 320 Ward Ave.
What The Sea Gives Me from MISFIT PICTURES on Vimeo. Announcing back to back Movie nights!!! I know it might seem strange to have a Movie night in the middle of the Christmas season, but I couldn’t pass up the opportunity to premiere both of these incredible movies! I’m really stoked to be able to offer this to our members and I hope you’ll be able to join us. The two movies we’ll be premiering are called Thundercloud and What the Sea Gives Me. 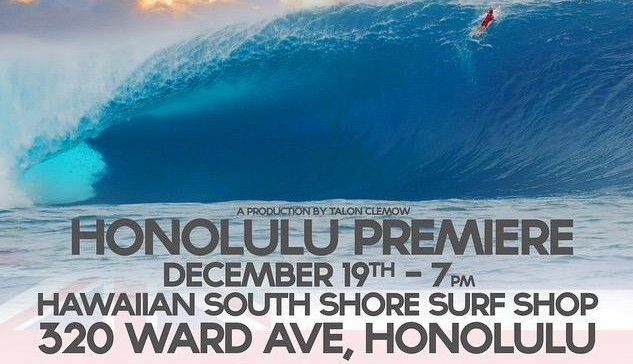 Both movies are incredibly well done and it was an honor for Hawaiian South Shore to be involved. A huge Mahalo goes out to members like you for helping our shop be able to do this! Below are the dates and times to both premieres, as well as links to previews etc… I hope you can make it. Thundercloud, put on by Red Bull, is $15 but all proceeds are going to support the great efforts over at Sustainable CoastLines Hawaii. If you are not already familiar with their organization, they are putting on some great community events and helping to clean up Hawaii’s beaches. Please come down and check out the movie and support them. The guys over at Red Bull called me and asked to use the parking lot to have the Honolulu Premiere of Thundercloud. It won the Documentary of the Year at the 2014 Surfer Poll Awards. I was more than happy to participate because all proceeds are going to support the guys at Sustainable Coastlines Hawaii. Red Bull isalso going to have their awesome SpecOps truck at the event. Thundercloud from onepalmMEDIA on Vimeo. WHAT THE SEA GIVES ME is a feature length documentary comprised of intimate and candid interviews with some of the ocean’s most extraordinary ambassadors. It will give you an honest and personal look through the eyes of those who thrive under the most extreme water conditions, those ensuring the proper care of the oceans for future generations and those who simply derive a sense of pure joy from the sea. Hope to see you at the store for this World Premier!